Nivelles can be proud that of any town in the old former Low-Countries, it was the first to possess a human processional giant. It's existence is recorded in 1367, and it probably dates from even before this. The Nivelles giant has been called successively Goliath, Gholiath, Golyas, and Golias. The primitive name Goliath, documented in 1457, was recorded as Golias from 1515 till 1574, the moment when religious and political troubles caused the suspension of many public rites and customs. When the giant reappears in 1584 he is called Agayon, this becoming Argayon for the first time in 1600. The exalted age of Argayon contrasts with the lateness of his marriage, for it was not until 1645 that the giant, the pride and joy of the people as a bachelor, was to be blessed with a wife, Argayonne.The marriage was felicitous, and later a son was born: Lolo, baby-faced and with his legendary dummy round his neck. Like many venerable institutions, the Nivelles giants did not escape the reforms of Joseph II, and on the 10th May 1786 the latter forbade them to accompany the procession, and on the 26th May that year, put them up for auction. The sale made 123 florins and 2 sous. Argayon, with his wife and son and the horse Godet re-appeared at the national celebrations of 1806. We hear of another outing in 1854, an unfortunate escapade, since the giant fell in the river Thines! After this misadventure he remained locked up until 1878. Another period of confinement ensued till 1888. On the 13th July 1890, dressed in brand new clothes, the giants took part in a grand procession in Brussels, organised to celebrate the 25th anniversary of the accession of King Leopold II. It was during this procession that Argayonne lost her head in the middle of the street! Our giants didn't come back to Nivelles till the 12th October, but their return merited a triumphal reception. They also visited Lille in 1892, and after the First World War, Brussels, during the Universal Exhibition of 1935. The Eagle, the Unicorn, the Lion, the Dragon and the Camel had also been sold in 1786. Their reconstruction was envisaged in 1889 ,and again in 1912, however only the Lion, Dragon,and Camel were restored to us, 140 years after their disappearance. Sadly, the giants were victims of the German bombs which fell on Nivelles in May 1940, and were destroyed. Restored after the war with the help of drawings from 1929 by Paul Collet, Argayon, Argayonne, Lolo and the horse Godet had their first outing in Nivelles in May 1950. The reconstitution of the entire Menagerie was undertaken by the Office of Tourism. 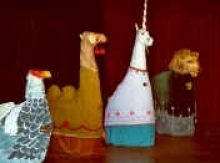 The first animal, the Unicorn, appeared on the 28th February 1982.The Camel was added in 1983 and the Eagle in 1984. Then came the Dragon and the Lion, and finally the horse Bayard was reborn, after an absence of 400 years, on 28th September 2001. It is interesting to note that the Nivelles giants have travelled far and wide since the Second World War. Argayonne is particularly widely travelled, having represented Belgian Giants at a week- long celebration in Birmingham, Alabama, USA in 1978, along with the Giant of Ypres. Today, Argayon, Argayonne, Lolo, the horse Godet and their Menagerie never miss a chance to join in popular festivities, if only by promenading round the Grand Place, and add greatly to the pleasure of great and small alike with their stately silhouettes, whenever they do.